Today, the Committee of the Whole in the state Senate discusses and votes on HB 2613, which eliminates licensing of geologists and other professions. The hearing is expected to start between 1:00 and 1:30pm today, with HB2613 first on the agenda. 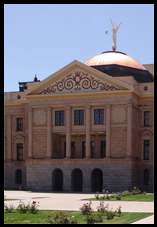 A number of Arizona geological professional organizations and companies oppose the bill.